Good Plumbing, Heating, and Air Conditioning, Inc. handles plumbing, heating, and cooling needs throughout Bucks, Montgomery, Chester, and Lehigh counties. We provide a wide variety of services for our residential and commercial customers including new installations, maintenance, and repairs. With professional grade equipment and parts, as well as the highest standards of service, Good, Inc. will handle all your plumbing and HVAC needs efficiently and effectively. We have built our reputation on quality workmanship at an affordable, fair price. 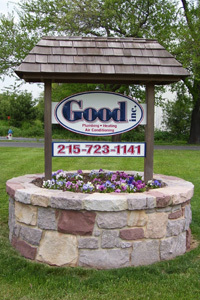 Good, Inc. provides emergency service 24 hours a day, seven days a week. Call 215-723-1141 to speak with one of our courteous staff members. Pennsylvania Home Improvement Contractor Registration Number: PA5134.